South Africa is a nation obsessed by sport and as a result the fortunes of the country's national sides often dominate the front and back pages of newspapers and saturate the various radio, television and online media outlets. This month has seen rugby and football battle it out for the headlines with the British & Irish Lions tour and the Fifa Confederations Cup vying for the attention of the sporting public. That head-to-head intensified this past week with two pulsating clashes that underlined sport's amazing ability to captivate the masses. The Springboks edged out the Lions in the crucial second Test of their three-match series in Pretoria while their football counterparts, Bafana Bafana, went down bravely to Brazil in the Confederations Cup semi-finals. Both matches not only delivered in terms of drama, excitement and controversy but also offered a fascinating insight into the appeal of each sport. Football, or soccer as it is more commonly known, is the country's most popular sport with a primarily black fan base and the majority of the 48,049 fans that packed into Ellis Park in Johannesburg on Thursday night reflected that fact. In almost complete contrast, rugby is the game of choice amongst whites, especially Afrikaners. As a result it was no surprise to see white faces dominate the 52,511 capacity crowd that was drawn to Loftus Versfeld in Pretoria for the Springboks' clash with the Lions. However, the Lions' incredible travelling support may have had something to do with that with estimates suggesting up to 25,000 were present to cheer on their team. Both sports have tried to nurture a more representative audience but they are battling decades of tradition. The Springboks' 1995 and 2007 Rugby World Cup triumphs went some way to opening the door to entire population while the 2010 Fifa World Cup will no doubt prove a magnet to all. For further evidence of each sport's social roots you need look no further than the pre-match build-up. The country's unique hybrid anthem, adopted in 1997, contains extracts of the traditional African hymn Nkosi Sikelel' iAfrika and the former anthem Die Stem van Suid-Afrika as well as original English lyrics. It also includes five different languages - Xhosa, Zulu, Sesotho, English and Afrikaan - representing the make-up of the country's population. While the anthem was sung loud and proud at Ellis Park it took on a new dimension at Loftus where the Afrikaner-dominated crowd lifted that particular stanza to a whole new level. That is not to say that the Ellis Park crowd was left wanting in terms of enthusiasm - far from it. The carnival atmosphere generated by the Bafana Bafana faithful was a feast for the senses. "Love it or hate it, the vuvuzela is an integral part of the game in South Africa....and when multiplied by tens of thousands creates an atmosphere like no other in the sporting world." 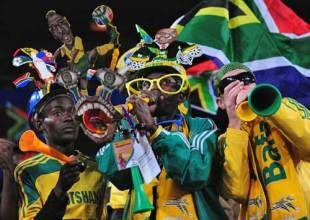 Love it or hate it, the vuvuzela is an integral part of the game in South Africa. The plastic horn, which emanates a sound like an elephant or perhaps a complete beginner on the trombone, is a mainstay amongst football fans and when multiplied by tens of thousands creates an atmosphere like no other in the sporting world. The widespread use of the instrument has attracted criticism from some quarters with some even calling for it to be banned from next year's Fifa World Cup - such is the irritation caused. The vuvuzela's smaller, kazoo-like cousin sounds more like a baby wailing but adds yet another layer to the wall of sound that is an omnipresent element to match day. The energy levels at Ellis Park were also impressive from start to finish. The Bafana Bafana players set the tone as they danced and sang their way into the stadium and the fans followed their lead, matching their heroes' stamina with a never-ending song and dance routine. The country's football fans can also boast more colour than their rugby rivals. From the pimped-up hard hats (Makarapa) to the over-sized sun glasses, from the replica shirts (worn back-to-front) to the national flag that is either waved or worn. For those looking for that extra bit of Madiba magic there are also the Nelson Mandela face masks. 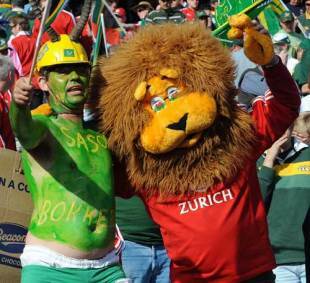 The Springboks' fans are not shy of dressing up either although the vuvuzela has yet to be adopted by the oval ball game. Green and gold are again the colours of choice with the blessing of the replica shirt manufacturers. But when it comes to dressing up for the occasion they were a clear second best to the Lions' fans. The outfit of choice appeared to be either the Zulu war uniform or the full on Lion costume while for both sets of supporters beer was the accessory of choice. Banners have long been a staple prop for sports fans and the Bafana Bafana supporters were no different. 'Yes we can' claimed one; 'Brazil for supper' said another. The Lions' fans also showed a thirst for popular culture with one reading 'Paul O'Bama - Yes We Can'. The Mexican wave, another fan favourite, made an appearance after just 20 minutes at Ellis Park but so compelling was the action at Loftus that the fans felt no need to entertain themselves. At both matches it was a delight to see fans from both sides mixing with each other both outside the stadiums and inside where many found themselves sitting alongside each other. In the end Bafana Bafana could not conjure the victory their fans dearly wanted. Against the odds they dominated their illustrious rivals for much of the game but crucially failed to take their chances. As a result they were made to pay by an impressive late strike from Brazil's Daniel Alves. The home fans were quick to their feet to praise their team and not even a cruel defeat could silence the vuvuzelas that played long into the night as the supporters made their way home. The Loftus clash was arguably more dramatic with South Africa's Morne Steyn sealing the win, and the series, with the very last kick of the game. Again the fans rose as one to hail their heroes after a brutally intense battle. As in Johannesburg the winners found the energy to celebrate their hard-earned victory while the losers fell to their knees having given all they could. There may well be concerns about security, ticket prices and infrastructure ahead of next year's staging of the Fifa World Cup but the enthusiasm of the country's sports-mad population should ensure that the party goes with a bang.